SACRAMENTO, California (September 3, 2017) — Hometown golfer, Blake Abercrombie improved on his opening 66 with a second round score of 64 on Sunday to hold a two shot lead heading into Monday’s final round at Haggin Oaks in Sacramento. Abercrombie, who began on the first hole this morning after beginning on No. 10 yesterday, jumped out of the gate, making birdies at 2, 5, 6, 9, 10, 11, 17, and 18 without making a bogey all day. And like yesterday, he did it in the valley heat wave that has California schools canceling football games statewide. “I’m from Sacramento, so I’m used to the heat. I just like to compete,” said Abercrombie. 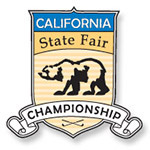 If Abercrombie can continue to play error-free golf, and compete in the way he enjoys so much, the California State Fair Amateur Championship is his to win. Patrick Murphy is two back at 12-under-par for the tournament with Saturday’s overnight leaders, Isaiah Salinda and Devondeep Bling in a tie for third at 11-under. Cody Riecks is alone in fifth at 10-under. Scores are low at Haggin Oaks, with 51 players under par through two rounds. Last year's champion Ramiz Jamal is tied for 17th at four-under.